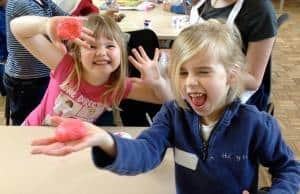 Fun Science regularly run holiday clubs for children in Bath, Sheffield, Glasgow, Sunderland, Bury, West Lancs, Dorset, Shropshire, North Yorkshire and Cheshire. Each holiday club is run by highly trained staff with enhanced DBS checks and first aid training so the safety of children is our top priority (with fun a very close second!). Just brilliant! My boys love science and the team do a brilliant job! We can’t wait for holidays, so we can book in to make some mess!! – A happy mum! Parents and children all love our fun days and you can read for yourself just how popular they are by clicking on the testimonials link to the right of this page. Alternatively you can click on the locations to the side of this page to view upcoming holiday clubs in your area.